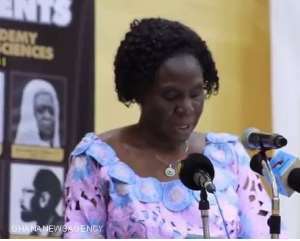 Professor Akosua Adoma Perbi, Head of Department of History, University of Ghana, has described women as custodian of culture and knowledge. Prof Perbi said in the pre-colonial system, anytime there was a problem such as political crisis, tribal conflicts and misunderstanding, people consulted the 'old woman' for advice. She explained that, colonialism had erased some of these roles played by women that is why 'Yaa Asantewaa' became an important figure in the country's pre-colonial political system. Prof. Perbi made the assertion in Accra at the Dr Joseph Boakye Danquah Memorial Lectures on the topic: 'Women in History: The case of Ghana-Pre-Colonial, Colonial and Pre-Colonial,' which was organised by the Ghana Academy of Arts and Sciences (GAAS). She said the three-day lecture would focus on the role of women before the expatriate came to the country, what it was traditionally, the role women played, the respect they were given and to some extent they were the breadwinners of the homes. According to her, women played a contributing role in the pre-colonial system in the field of social life, political scene, military sphere, religious, and in the economy as well. Prof Perbi said Ghana was made of a traditional system, where some of the traditional roles were respected especially that of the queen mothers, but had now been influenced by the western world, saying 'western ideas have slipped into our culture'. 'Women have not had enough support in modern times because most of the men think their contribution to nation building is not strong, saying what the country should do is to go back to our history and learn from the tradition,' she said. She said, although men dominated politics in Africa in the pre-colonial period, there were quite a few women who played active roles in the country's political dispensation. She said the alienation of women from the acquisition of wealth, in the conjugal relationships was strengthened by traditional arrangements, adding that among matrilineal groups such as the Akan, married women continued to reside at their maternal homes. Prof Perbi said ownership was another issue on the status of women in pre-colonial Africa, in that land was community owed, and that no one owned land individually as one did in western societies. She said given the male dominance in traditional society; some economic anthropologists have explained a female's ability to reproduce as the most important means by which women ensured social and economic security for themselves, especially if they bore male children. Prof Aba Bentil Andam, President of GAAS said the lecture was in honour of Dr .J.B. Danquah aimed at unearthing women's contributions in the country's socio-economic life.